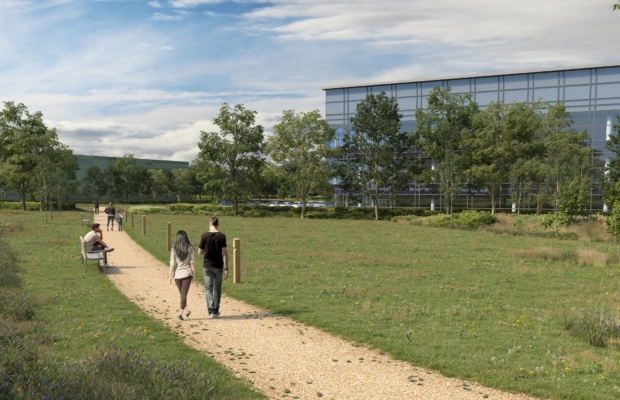 Consultants working on the project to bring a Science Park to Swindon, creating an international hub for science and innovation in a high-quality work environment, have released new images showing how the park will look and feel. The images show how the Science Park, with its setting of natural landscaping including extensive tree planting and water features, will provide a working environment that will help attract the most talented and highly skilled employees. Oxford Architects and Architecture in Motion have released the detailed images to accompany those already submitted as part of the project’s planning application. The Swindon Science Park development to the east of the A419 and north of the M4, near Junction 15, is being led by the Swindon-based Wasdell Group. Wasdell are considered by the UK government to be a nationally significant company, as world leaders in the design and production of innovative pharmaceutical packing, such as novel zero-waste materials and individually coded packs which tackle the global trade in counterfeit drugs. The first phase of the development, which will house a new headquarters for Wasdell Group, will create 600 additional jobs in Swindon by 2021. The second phase of the Wasdell development will bring a further 600 jobs to the town. The rest of the Science Park will provide facilities for a further 1840 employees working in the science and innovative engineering sectors, bringing the total of new jobs to 3040 by around 2025. Wasdell already employ 650 staff at the current Swindon site at Blagrove. Martin Tedham, MD of the Wasdell Group, said, “The vision behind the Swindon Science Park is to create a high-tech hub for the knowledge economy, with Wasdell as the anchor company. Swindon Science Park will enhance opportunities for wildlife through new tree planting and creation of scrub, meadow grassland and wetland habitats as part of the landscape and surface water drainage scheme. It will also provide safe and attractive paths for pedestrians and cyclists. A new shared pedestrian and cycle path will run along the Pack Hill boundary of the site to provide pedestrians and others with a safe walking route when travelling to or from Wanborough, and a well-being route along the interior perimeter of the site will allow employees and members of the public to walk or run safely within the site and enjoy its attractive natural features.